Chaka Fattah is a former Democratic member of the U.S. House of Representatives. He represented the 2nd Congressional District of Philadelphia, Pennsylvania from 1994 to 2016. Fattah resigned from office on June 23, 2016, following a racketeering conviction. On December 12, 2016, Fattah was sentenced to 10 years in prison as a result of the conviction. Chaka Fattah was born Arthur Davenport on November 21, 1956 in Philadelphia, Pennsylvania to Arthur Davenport and Frances Brown. His parents divorced, and his mother married David Fattah, changed her name to Falaka Fattah, and changed her son’s name as well. Fattah attended Overbrook High School in Philadelphia and graduated with his BA from the University of Pennsylvania’s Wharton School of Business in 1978. He received an MA from The John Kennedy School of Government, Harvard University in 1984 and a Master of Governmental Administration (MGA) at the University of Pennsylvania’s Fels Institute of State and Local Government in 1986. 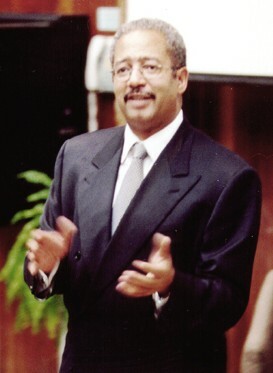 In 1987, Fattah founded the Graduate Opportunity Initiative Conference, an annual three-day informational and scholarship conference which aims to significantly increase the enrollment of underrepresented graduate students studying Science, Technology, Engineering, and Math (STEM fields). Fattah began his political career working as the Special Assistant to the Director of Housing and Community Development in Philadelphia from 1980 to 1981. He then served in the Pennsylvania House of Representatives from 1982 to 1988 and the Pennsylvania State Senate from 1988 to 1994. In 1994 Fattah was elected to the U.S. House of Representatives after defeating incumbent Congressman Lucian Blackwell in the Democratic Primary for Pennsylvania’s Second Congressional District. From 1995 to 2016, Fattah served as the U.S. Representative from Pennsylvania’s 2nd Congressional District. In 2007 Fattah launched an unsuccessful bid for Mayor of Philadelphia. While in the U.S. House of Representatives. Fattah served on the Appropriations Committee and on several subcommittees. Fattah is also the creator of Gaining Early Awareness and Readiness for Undergraduate Programs (GEAR UP). The program promotes college attendance among the nation’s most impoverished students. GEAR UP has become the largest pre-college awareness program in the nation’s history and has given more than $2 billion toward the educational advancement of low-income students. Fattah’s third wife, Renee Chenault-Fattah, is a former Philadelphia television news broadcaster. The couple, married in 2001, have one daughter, Chandler Fattah. The Congressman has an older son, Chaka Fattah, Jr., also a politician, who was convicted of felony bank and tax fraud in February 2016. Fattah ran for re-election to his seat in 2016, but he was defeated by Dwight Evans in the Democratic primary. A year earlier in 2015, Fattah was indicted on charges of bribery, money laundering, and bank and mail fraud, among other charges, making him vulnerable in the primary. On June 21, 2016, a federal jury convicted Fattah, 59, of bribery, mail fraud, and 27 other charges including misappropriating campaign, charity, and taxpayer money. He resigned from Congress two days later. On December 12, 2016, Fattah was sentenced to 10 years in prison and began serving his term at the Federal Correctional Institution, McKean, Pennsylvania on January 25, 2017. On August 9, 2018, however, the U.S. Court of Appeals for the Third Circuit overturned Fattah’s bribery convictions.